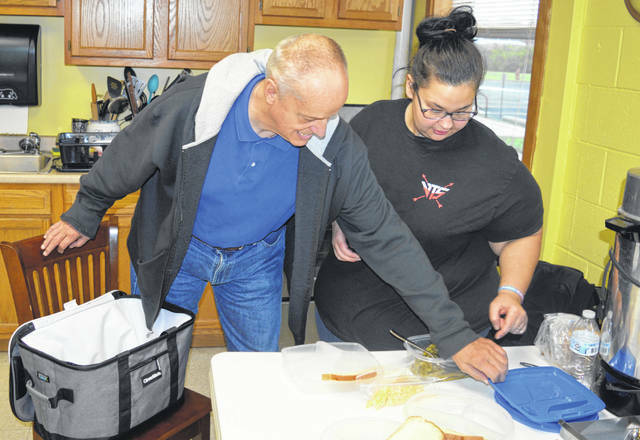 With the meals ready to go, Dennis Berwanger, left, and staff member Sarah Morgan, right, prepare to pack hot food in an insulated food carrier and then head out in a van to deliver meals to some local veterans. 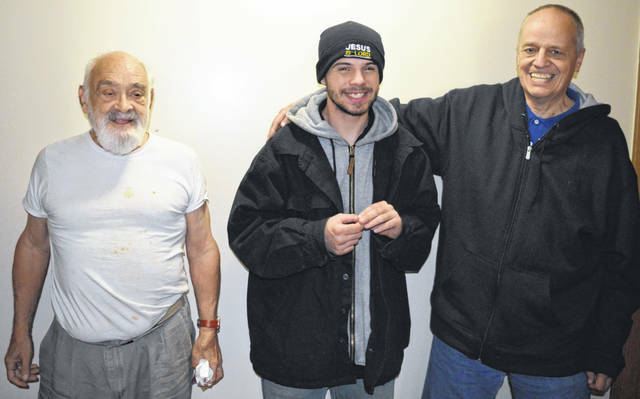 U.S. Navy veteran George Trickey, left, assembles for a photo on Nov. 2 with the two men who just delivered a free meal to him, Austin Powers, center, and Dennis Berwanger, right. 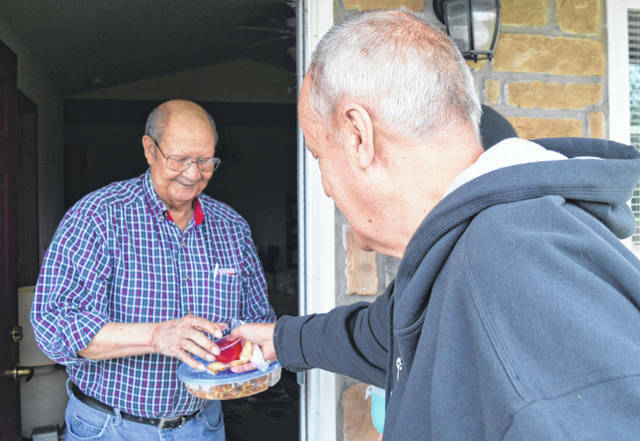 Floyd Banks, left, smiles as he receives a meal handed to him at his front door by Dennis Berwanger, right foreground, and Austin Powers, hidden. Banks is an Army veteran and a recipient of a hot meal service project started and conducted by individuals at Person Centered Services in Clinton County. WILMINGTON — Since January, individuals at Person Centered Services’ (PCS) Clinton Career and Life Enrichment Center have helped prepare and deliver hot meals every Friday to several local military veterans. On the first Friday of this month, the meal consisted of the pasta dish alternately called Johnny Marzetti or American (chili) goulash, along with green beans, buttered bread, colorful jello and shredded cheese in case the recipient wants to sprinkle it on the Johnny Marzetti. The first stop Nov. 2 was at the residence of Floyd Banks. He served with the Army Engineers from 1953 to 1960. The van also stopped at George Trickey’s place on the west end of Wilmington. He was in the U.S. Navy in the early 1950s. Another veteran was not at home. He left a note saying he was out of town and not to leave the lunch. He also left a bowl, returning it from the prior Friday as is the weekly custom. Homemade vegetable soup and salad roll-ups are two other examples of food delivered by PCS Clinton to the doorsteps of veterans, said Ball. They’re expecting to add one or two more veterans to their lunch-delivery list, but aren’t in the position to do the project on a big scale. Seven-year U.S. Army veteran Teresa McCann received the hot meals until her Friday schedule changed. “It’s been really wonderful. It’s just a sweet thing they do,” she said. Delivering the meals on Nov. 2 were Austin Powers and Dennis Berwanger. The veterans meal program was started by PCS Clinton staff member Tonya Dillion. PCS Clinton’s mission is to serve individuals with developmental disabilities. In June 2015, it partnered with Orion Inc., a nonprofit already located in Clinton County on State Route 730. Community-integrated programs and volunteer activities are key parts of what the agency seeks to provide and coordinate for the individuals it serves. And when it comes to local veterans, PCS Clinton individuals also regularly clean and groom the Veterans Memorial wall on Courthouse Square in downtown Wilmington.